A Multimedia Course Guide by Golf Media Inc. This intricate yet easy to use guide to the links has a feeling of class from the moment it installs on your system. Its instructions are extremely clear and I was ready to play the virtual course in minutes. Several features were a delight such as the 360 degree photos that were available in abundance. A slight shift of the mouse in the direction you wanted to go got you started, with tilt up and tilt down capabilities as well as pause. 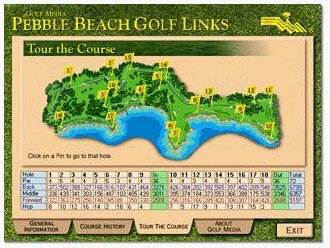 The photography, including the helicopter fly-overs of the eighteen holes, was always done under the best lighting conditions enhancing the instruction as well as the spectacular beauty of the course which hugs the Pacific coastline. Still photos of important lays of the fairway and green are instantly accessible as well as just the right number of tips by golf pro Johnny Miller. 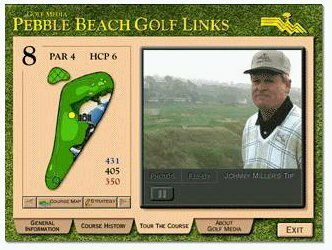 Miller’s ease and light sense of humor make following his tips enjoyable and the entire production, stills, fly-overs, full motion video (QuickTime), golf tips, audio, and 360 degree photos can leave you with a very detailed knowledge of each hole along with strategies, club suggestions and traps. In fact all the narration is well thought out and mature, with just the right amount of individualism in the voices. It was particularly interesting to hear the review of the course as written by the original architect, and to see the photographs that chronicle the course’s exceptional history. 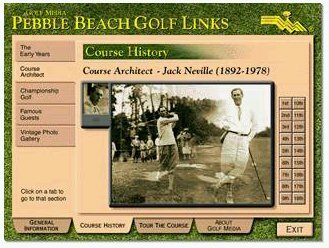 The design of the screen layout was clear and sound effects such as the swoosh of a swing when you clicked on a pin were amusing. It is details such as those that combine to make this a rich experience regardless of your golfing abilities. I did miss having a scan feature on the tips by Miller so that I could back up and watch short sections again without repeating the video from the beginning of the tip. That was a shortcoming for me and I would have enjoyed a more extensive photo gallery. It was also a little disconcerting when the historical photos displayed were sometimes different than those being described in the narration but these are minor criticisms compared with the overall excellence of the presentation. When I visited the Golf Media Website I enjoyed seeing the text of Mr. Miller’s golf tips displayed as text. It would be handy to print them out and take them along, should you be lucky enough to play the course. Even if your not a golfer, this is a CD experience well worth your time. If golf is your passion this guide should not be missed. All Images Copyright Golf Media - QuickTime is a trademark of Apple Computer Inc.